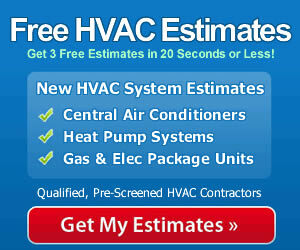 An HVAC system is the heating and air conditioning system in a home. The term HVAC stands for Heating, Ventilation and Air Conditioning and outlines the functions of the system. Most homes require heating of some sort. HVAC systems typically use either a furnace or a heat pump to supply heating. Furnace: The furnace may burn natural gas, propane or home heating oil. Electric furnaces are also available but are expensive to operate and are only used where it is impractical to install fuel line or vent the exhaust gases of a gas or oil furnace. Gas furnaces range in efficiency from 80% to 98%. Oil furnace models are usually 80% to 87% efficient. In a gas or oil furnace, the burner creates heat by burning fuel. The exhaust gases pass through a heat exchanger (high efficiency furnaces have 2) on their way out of the vent. The furnace blower pushes air over the heat exchanger in order to heat it. The warm air is forced through the supply ducts into the home while cool air is pulled into the furnace through the cold air return ducts. Heat Pump: A heat pump gets its name because it uses refrigerant to gather heat outside your home and pump it inside during a heating cycle. Heat pumps use electricity to circulate refrigerant. The refrigerant has the ability to create 3-5 times more heat than could be produced using just the electricity and a heating coil, such as in an electric furnace or space heater. To heat a home, the heat pump refrigerant collects heat in the outdoor coil. It carries that heat into the home where it sheds the heat in the indoor coil. The blower fan passes air over the hot coil to heat it before pushing it into the home through the supply ductwork. Unheated air is drawn into the system through the cold air return ductwork. Because furnace and heat pump HVAC systems use a blower fan to circulate air, they are often called forced air systems. In cool weather, heat pumps can be cheaper to run than some gas furnaces. Heat pumps contain a condensing unit that is installed outside and an air handler installed inside. The air handler may contain one or more electric heat strips that provide additional heating for cooler weather. They also serve as emergency heat if the heat pump The problem with heat pumps is that they become inefficient when temperatures fall below about 40F and so they are not as common in northern, colder climates. While a heat pump/air handler combination is most common, some heat pumps can also be included in an HVAC system with a gas furnace. The heat pump supplies heat in chilly weather. When temperatures fall, the furnace takes over. The systems can be programmed to switch from heat pump to furnace at any temperature desired. These are called dual fuel or hybrid heat pumps and are becoming more popular in cooler climates. The vast majority of air conditioning is supplied by traditional central air conditioners. They consist of a condensing unit installed outside and a evaporator coil installed with the furnace. They use refrigerant to collect heat in the inside coil and carry it away. This makes the coil very cold. The furnace blower circulates air over the coil to cool it before pushing it into the rooms of the home via the supply ductwork. The hot refrigerant cycles to the condensing unit where it sheds heat in the outdoor coil which functions like a radiator. The condensing unit fan then disperses the heat. Heat pumps also supply air conditioning since their basic equipment is essentially the same. The heat pump is equipped with a reversing valve that changes the direction and function of the refrigerant. During heating, it pumps heat from the outside air to the indoors and when cooling, it functions exactly like a central AC. The term ventilation traditionally refers to the venting of exhaust gases from a gas or oil furnace. Less efficient models must be vented through the roof because the exhaust gases are quite hot. High-efficiency furnaces can be vented out the side of the house because of the lower temperature of the exhaust gases. Fresh air ventilation is becoming an increasingly important part of the HVAC industry. Newer homes are built very tight and often include house wrap to keep out drafts. This makes homes more energy-efficient but it prevents fresh outside air from entering and stale indoor air from leaving. The EPA now calls indoor air pollution in homes one of the most significant forms of pollution. The HVAC industry is responding with new ventilation products such as whole-house ventilators. They are installed in the ductwork and they work to exchange indoor, polluted air with fresh outdoor air. More advanced home ventilators have a heat exchanger to reduce heat loss or AC loss. During a heating cycle, the warm air from the house pre-heats the cool air entering the house without mixing with it. The heat exchanger does the work. These are called heat recovery ventilators (HRV) and they also pre-cool incoming air during an air conditioning cycle. Energy recovery ventilators (ERV) aren’t as effective pre-heating air but they do a good job cooling incoming air in the summer. They are more common in warmer climates while HRVs are more common in cooler climates. These are the basics of what an HVAC system is and what it does. Being familiar with the basics will help you discuss your home’s HVAC needs with an HVAC professionally, giving you the information you need to take control of the selection process. You’ll end up with an HVAC system that is right for your needs, and one you will be happy with in the years ahead.